Apache JMeter is one of the most popular open source systems for testing applications, and also a 100% Java scripted desktop application. It is designed to test the functional software performance of web applications. Applications can be tested for both the static and dynamic resources (queries, files, logs, scripts, and servers). It also allows the developers to test the heavy load applications and help analyze the performance and strength of such applications by examining different load types. Based on GUI design, Apache JMeter offers a simple and faster interface capabilities through which multithreading can be performed. Also, it is highly extensible which means that it supports plug-ins and third party integrations. This makes testing easier across different browsers, servers and testing platforms as such plug-ins add to the testing capabilities of the software. Every day, millions of web applications are designed, developed and floated across different platforms. The cut-throat competition in the market is not easy to face, therefore these applications need to offer a competitive edge to stay on the market. Apache JMeter is one the innovative software products which offers web application testing capabilities with a set of tools and integrations. Through Apache JMeter, developers can test performance and functionality of the web applications and measure their compatibility and load strength across different platforms. Apache JMeter offers full portability of testing tools on different browsers and servers. It can run tests on servers such as Web (HTTPS and HTTP), JMS, SOAP, and POP3. This way, usable and workable applications can be developed in an error-free way. The framework of open source coding allows developers to develop applications with a diverse set of coding options. The extensive compass of open source coding infuses freedom and novelty for the structural design and infrastructure of the applications. This enables developers to work as a community on the development of web applications and share their knowledge and coding forte with each other. Additionally, by using the facility of open source code, the developers can download the code and make modifications in it according to the application development requirements. So, developers can introduce customization by using the open source code. If you are considering Apache JMeter it may also be beneficial to check out other subcategories of Best Test Management Software listed in our base of SaaS software reviews. Since each enterprise has specific business requirements, it is sensible for them to refrain from seeking a one-size-fits-all ideal software system. Needless to say, it would be futile to try to find such an app even among widely used software platforms. The smart thing to do would be to list the various vital elements that need consideration such as required features, budget, skill levels of employees, company size etc. Then, you should do your homework thoroughly. Read some Apache JMeter reviews and check out each of the other apps in your shortlist in detail. Such exhaustive groundwork can make sure you discard ill-fitting applications and zero in on the app that presents all the aspects you require for business success. 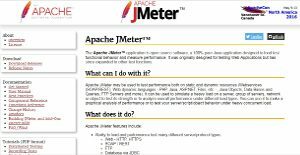 How Much Does Apache JMeter Cost? We realize that when you make a decision to buy Test Management Software it’s important not only to see how experts evaluate it in their reviews, but also to find out if the real people and companies that buy it are actually satisfied with the product. That’s why we’ve created our behavior-based Customer Satisfaction Algorithm™ that gathers customer reviews, comments and Apache JMeter reviews across a wide range of social media sites. The data is then presented in an easy to digest form showing how many people had positive and negative experience with Apache JMeter. With that information at hand you should be equipped to make an informed buying decision that you won’t regret. What are Apache JMeter pricing details? What integrations are available for Apache JMeter? Pros: I like that when using Jmeter there is no need to programming test scripts and this is extremely useful if you’re familiar with HTTP requests. Also, it allows us to write test cases. The good thing is that Jmeter’s test scripts are simple and easy to maintain and it can be copied and saved. Cons: I don’t like that JS program cannot be verified by using Jmeter and this means that you have to verify it by yourself. Also, the program cannot determine wheter the program is executed correctly or not. Pros: First of all, this is easy to use software that has great graphical UI with wonderful set of features and it can be used even by those who are not tech savvy. It helps you to define load, stress testing notions and performances. I like that it’s configurable tool and it allows us to create both simple and complex test plans. In addition, you can use CSV files as inputs and create graphical reports according to your needs. Also, it is free to use. Cons: The graphical interface is not easy and intuitive, the documentation that’s available is not understandable so you cannot easily figure out how to start and create test plans. Also, sometimes it crashes when used for non-Java apps. Furthermore, you’ll need powerful PC if you need to use test plac with more than 1000 concurrent virtual users. If you need more information about Apache JMeter or you simply have a question let us know what you need and we’ll forward your request directly to the vendor.